Kind of! Okay so the E-mail thing. 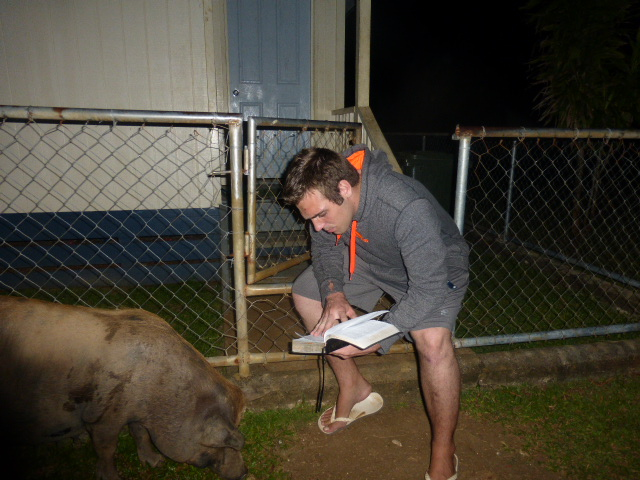 I was not going to E-mail today because I received an answer to my prayer to be obedient to the mission rules! 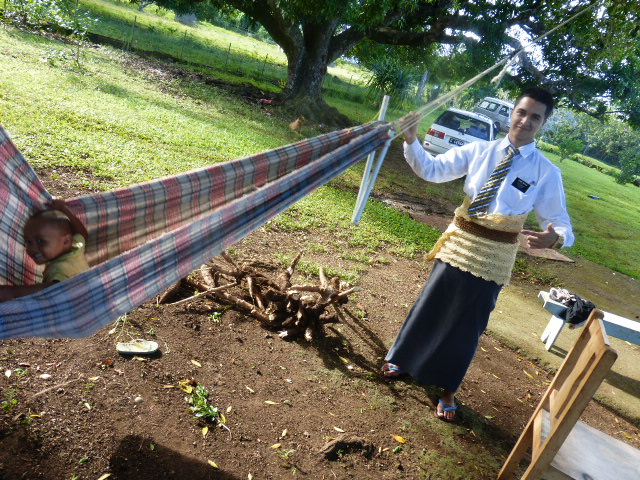 But then received a call from Elder Harmon who had just got of the phone with President Tupou! He said we are able to use computers at a public Internet house! Luckily there is one in our area! So we are able to net when its open! But the bad news is that most areas do not have them! 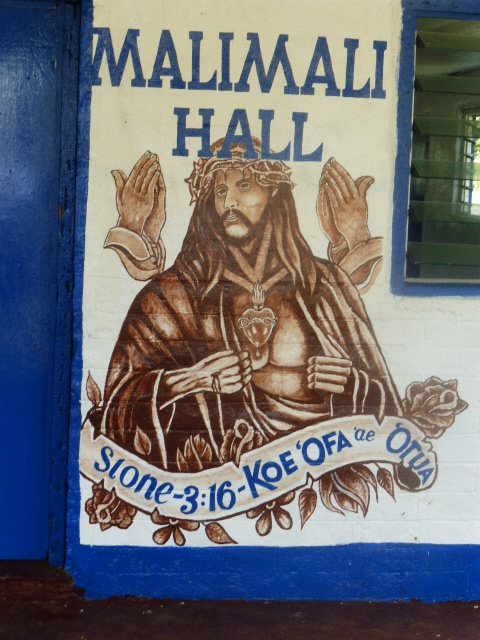 I've only known of two in Vava'u. So you are blessed! Haha! The reason why is because of Disobedience on the computers! It's a real pain because when we obey the rules and do our best we get the punishment along with everyone else. 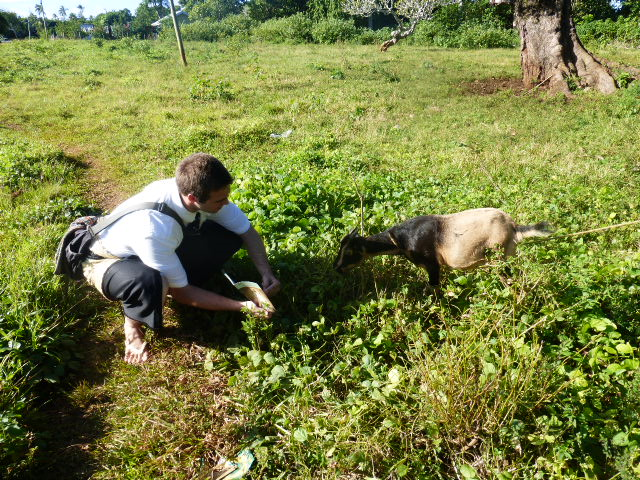 I have more to say but want to remain positive towards my family of Elders and Sisters in Tonga! It actually wasn't President Tupous call, It came straight from Salt Lake City! So It is from the Lord and it will only bless us! In a way I love it because we can only focus 100% on the work! But on the other hand I love hearing from you guys each week and receiving the help I need to carry on in my endeavors. I've been reading about Job. What a guy???!!!! He was so strong and faithful! Even when Satan took everything he had he blessed the Lord and remained perfect and upright escheweth evil! I am trying to be like him and always be obedient and thank the Lord no matter what situation I may be in because It could always be worse! I think that was from Uchtdorfs talk! One thing Pres. 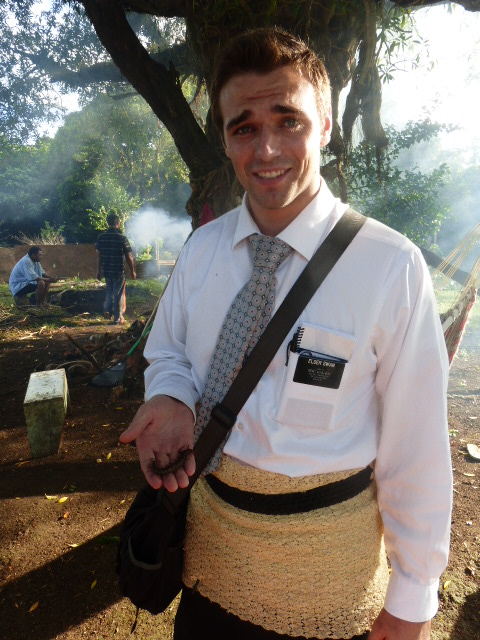 Tupou said was in the Book of Mormon the verses that say "it will come to pass" are incredibly powerful! Know that with every trial we receive, it will come to pass! We had an opportunity to have President Tupou come to Vava'u for a mission Conference! He helped us a great deal in our struggles to find people to teach! After words we decided to put his lesson right to the test at our fafanga! He wants us to role play with members so they won't be scared to invite people to listen to us! So we role played! Usually the family feeds us and kinda wants us to leave! But the Lord blessed us with the entire family sitting in the living room! So we went for it! 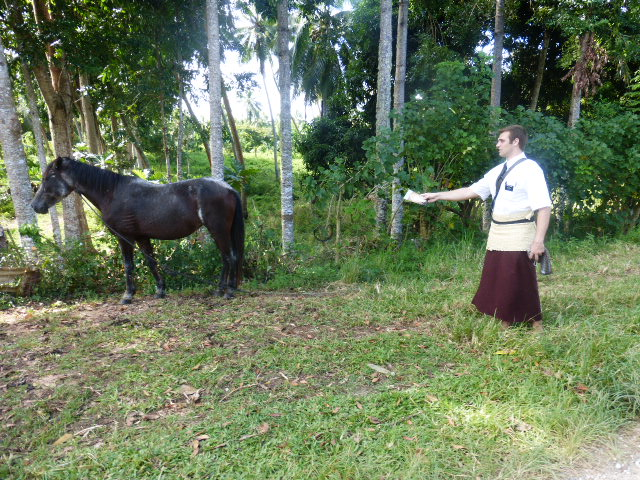 The dad (Faleula) Is usually standoffish and shy and not really into missionary work! But after a few role plays with his kids I asked him if he would role play! He said sure so Him and his wife role played for a good 5 min! It was awesome and the spirit was super strong! We challenged them all to invite the people who they role played and we will check up on them today! We also realized the Members aren't supposed to help us... We are here to help them. They are all really busy! 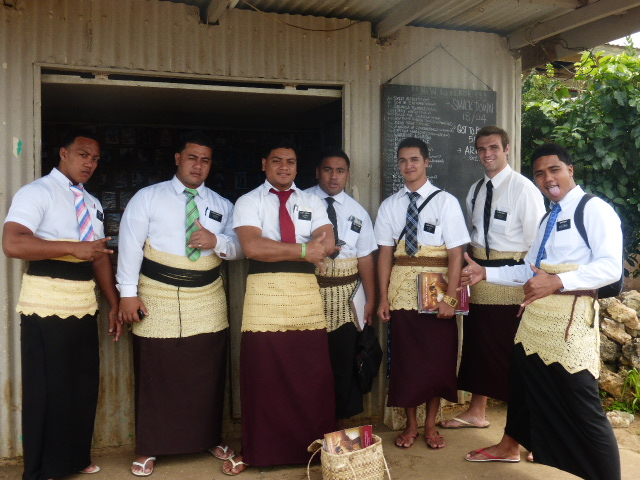 So we are here to visit the inactive members and invite people to come unto Christ! After putting that into perspective we went our searching for Inactive members! We have 14 or so that we are gonna try and bring back and teach their families! The work is picking up! I only have an hour so times almost up! As for things I want/ need! conference edition of the Liahona! Letters from friends since I have no more e mail most likely! More church things :) just the little things you always send! 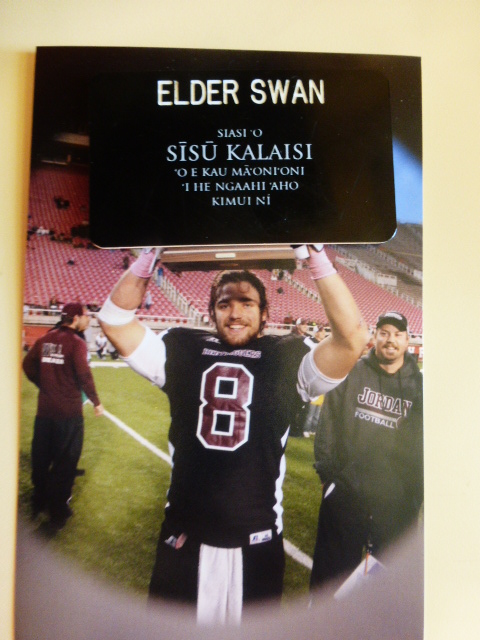 Scripture tabs for my Tongan scriptures! Small English PMG (Someone took mine)kinda.. I gave it to a member that is serving in SLC in June! Spanish to English dictionary... If you think that's a dumb idea its okay! I thought it could be easier to learn 2 languages! Just learn a word for each one! If you can! Well another week down in Houma! It's been a better week. We were able to teach 2 lessons this week... That's more lessons than we have in 4 weeks... We've been having a hard time here but I think It is slowly picking up! We are still trying to catch Samiu to teach him but His family was sick and he was taking care of them then on Friday he was drunk... So we couldn't really teach him hahaha. But we did get to teach Siosaia, he is 17 and is a pretty cool kid. 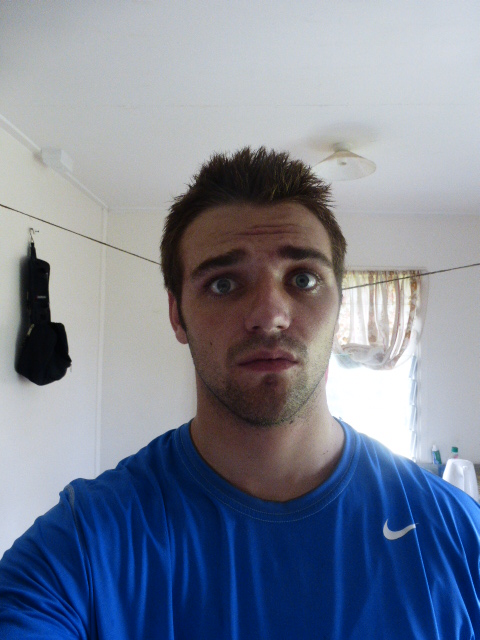 He's pretty strong in the Wesleyan church but He set up a time for us to teach him today at 4 so I hope that goes well! We also got to know a girl who is 18 named Mele. She has a wild story but has talked to the Elders before! She was going to be baptized but her dad wouldn't let here. But now that she is 18 she can choose! So I am hoping we can teach her soon and give her this wonderful gift of Eternal life. There are times when I think "What's the point of me working and trying to teach these people when they don't like me or don't listen... But then I tell myself that no matter what I will try because it is Eternal Life!" So that's my motivation. It's tough but I know there are those who will take a leap of faith and grab hold of the Gospel! So I just need to find them! And I will! I love you all so much!!!! Fast and pray for our success and also the success of all missionaries !!!! Love you !!!! I hope you have an awesome time in Vegas!!! TANNER HAPPY BIRTHDAY... 17 .. Holy Freak... I guess I'm next..20- We are old goobers man! Take it easy. His name is Tomasi and he is our best friend! 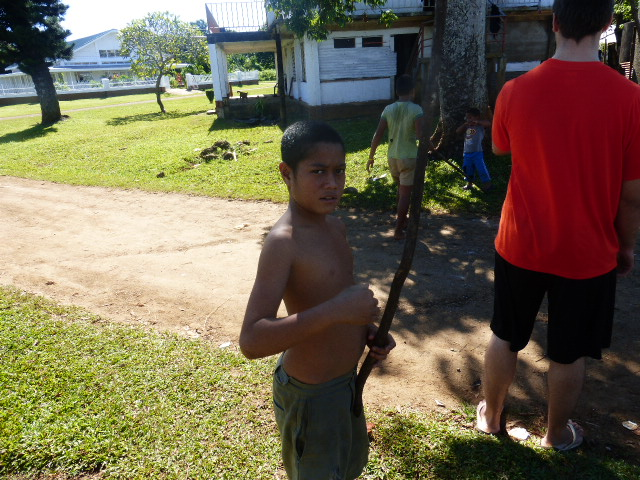 This morning I was fighting some kids with sticks. 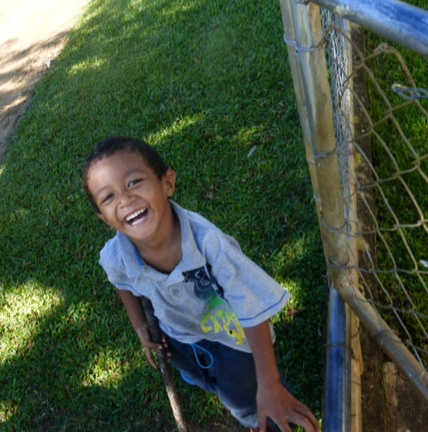 This is Sione toki, we are trying to teach his family. It's not working out to well but he is a stud! 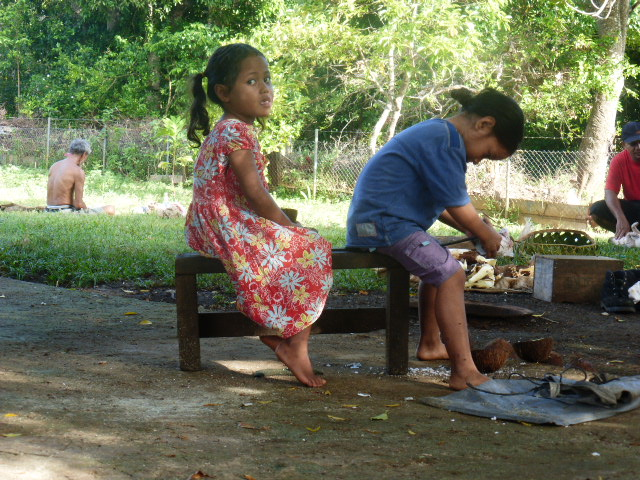 These two cute girls Lute and Salifaia are grading coconut meat. 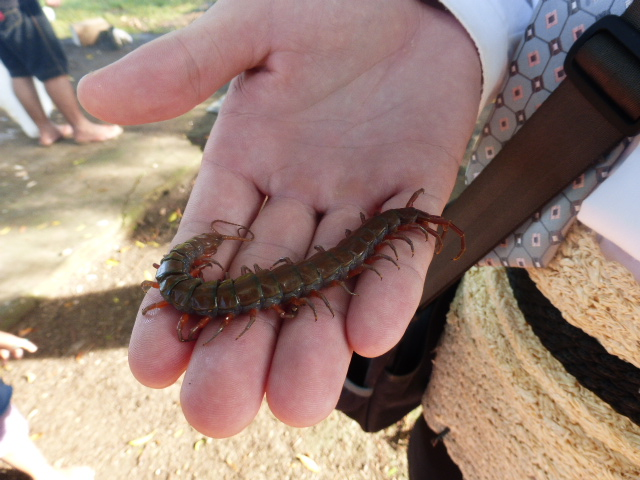 This is a Molokau~~ They are huge centipedes and they are poisonous. Our Branch Pres. took the fangs out Haha !!! So CREEEPY!!!! 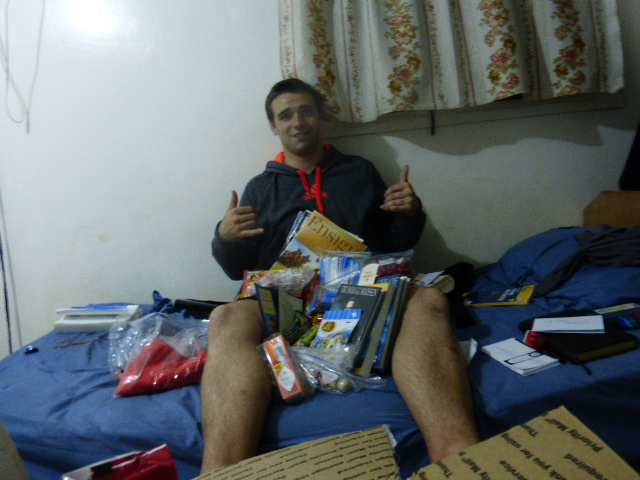 Thanks so much mom I got my packages! I have already finished Legacy of Faith and Joseph Smith! I loved them! 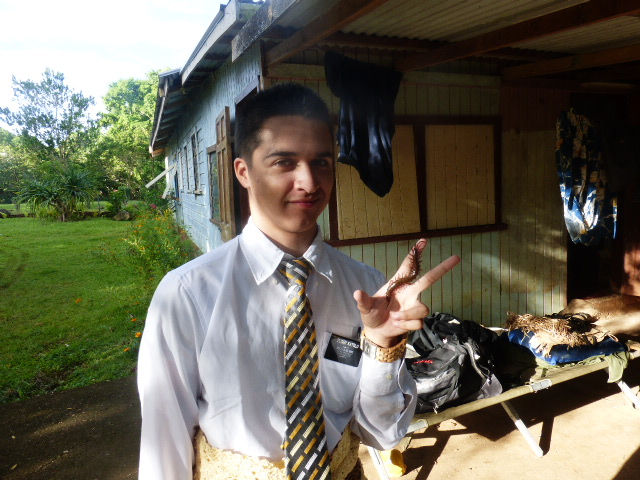 We had not heard from Tyler for 2 weeks and it's been just about killing me waiting and waiting for an email but late last Sunday night we got a quick email from Elder Freer letting us know that Tyler was fine and that their computer was broken and he would email us as soon as he could. 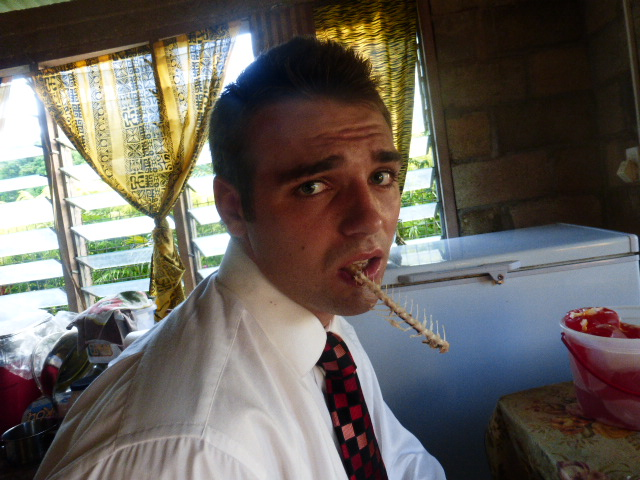 What a sweet and very needed email from Elder Freer~ thank you. Then I had a wonderful surprise Tuesday morning when I opened my email and saw this from Tyler. MOM!!! I got a chance to e mail today! So I will make it fast! The past two weeks have been..... The same!! Kinda no fun without the success, but I am so happy for all the Elders that are getting success! There will be a day!! :) But Last Sunday we showed up to church with 0 people there 30 min before it started... Finally 15 min later our branch pres and 1 other showed up... We started church with 5 people including me and Elder Katolo. Instead of bread we had crackers which was funny! Katolo blessed the bread and water and I passed! After The Sacrament was passed 4 more people showed up but that was it! Our Branch pres decided to end church after everyone bore their testimonies and we just went to all who were sick and shared a message and gave blessings! It ended up being really cool! Transfers were this week and I am staying here with Katolo! We both think next transfer we will be training.. 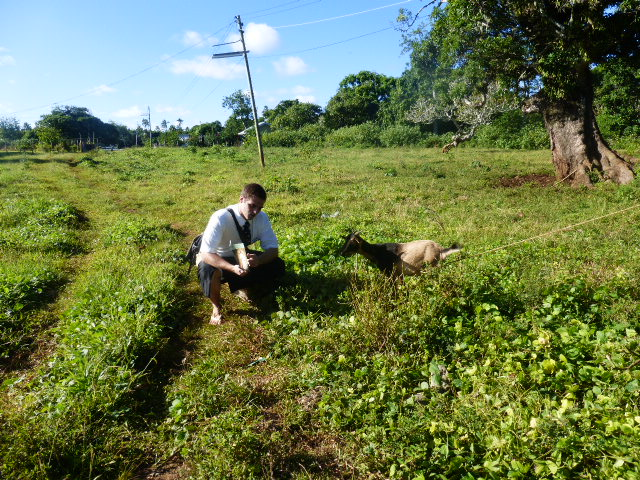 Which I hope I train a Palangi! We have 1 solid investigator and He is really doing well. We set a baptism date for the 19th! So hopfully that can go through and all will be well! I want you all to know that everything will be okay. I love you all sooo much! Miss you heaps! !